I'm a big fan of Sacla sauces as I love Pesto, so I was excited to find out that Sacla has launched three new, "Free From" sauces: Free From Basil Pesto & Tomato Stir-In, Free From Creamy Tomato Stir-In and Free From Creamy Whole Cherry Tomato Pasta Sauce. The new sauces are made in Italy, and are suitable for vegans, certified gluten free, dairy free and wheat free - so suitable for those followig a variety of free-from diets or perhaps just trying to eat a little more healthily. 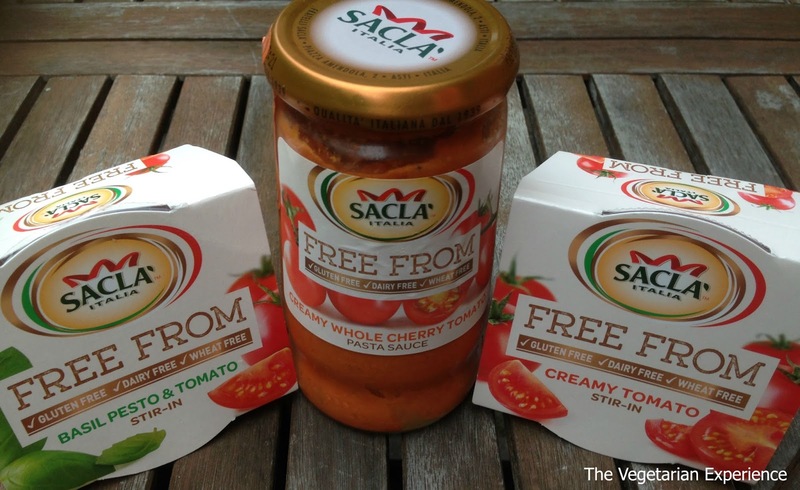 Sacla’ Free From sauces give a wonderfully homemade feel to any eating occasion. We tried the Sacla sauces and kept it simple by serving with Pasta. The Basil Pesto and Tomato Stir In was our favourite - although we loved the other two sauces also. As Pesto may sometimes not be vegetarian, it was also reassuring to know that these are completely Free-From. Sacla’ Stir Through sauces are available from Waitrose and Ocado from 28th August priced £1.89 for the stir in sauces (150g tub) and £1.99 for the Free From Creamy Whole Cherry Tomato Pasta Sauce (350g).